Cousins River, a modestly sized home on the Maine seacoast by G•O Logic, was designed to passive standards. Wide expanses of south-facing windows allow a concrete floor to be thoroughly warmed by the winter sun (Photos by Trent Bell). 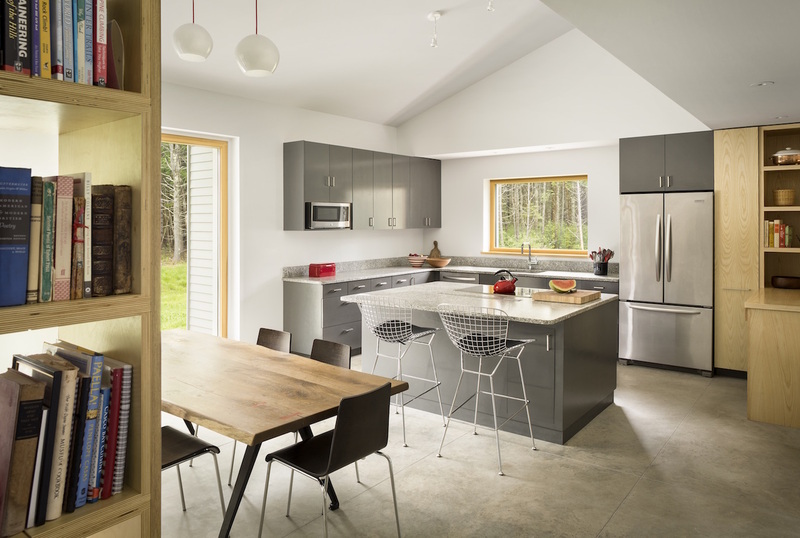 Whether it was happenstance or fate that brought them together, before becoming business partners in the design/build firm G•O Logic, Matt O’Malia and Alan Gibson both lived and worked in and around Belfast, Maine. Gibson, a contractor, and O’Malia, an architect, met because their children went to the same daycare and then the same school. That school was in a house in Belfast that needed an addition. O’Malia volunteered to design it; Gibson ended up as general contractor. Working together on that project in 2004, they discovered a common interest in energy-efficient building. Gibson and O’Malia attended several conferences and seminars as part of their building performance research, including the Northeast Sustainable Energy Association (NESEA) conference, in Boston, where they heard an architect from the Passivhaus Institute in Germany explain Passivhaus, an energy performance standard for buildings developed and engineered there. “It instantly clicked that that’s what we should do,” Gibson says. The home needs minimal heating, but for extremely cold days, a wood stove provides supplemental warmth. The two wanted to try to build a passive house to see what it would involve. “Being design/build, we quickly understood that we would have total control over the concept, material selection, assembly design, in a way that allows flexibility to innovate all the more easily,” O’Malia says. They formed G•O Logic in 2008 and, in 2009, working with the Passivhaus Institute, built a little red house they called the GO Home, built on spec. “We knew no one would hire us to do that,” Gibson says. “We wanted to show the world that it could be done in this way.” Theirs was the first house in Maine certified by the U.S. Passive House Institute, one of just 12 in the country at that time. The year that Gibson and O’Malia founded G•O Logic was a terrible time to start a business, but the two rode out the downturn and grew their business all through the recession. Gibson attributes that success to having a niche and a specialty. O’Malia notes that as the economy has improved, more builders are building passive houses. At the same time, G•O Logic has expanded its range of services to include institutional and multifamily projects, which provide a cushion for when one market expands and another contracts. G•O Logic has had eight construction starts this year to date, compared with 11 in all of 2015. The firm’s construction gross so far this year is $1.7 million, compared with last year’s total of $2.7 million. 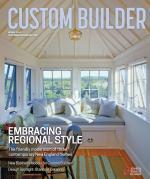 Gibson and O’Malia have built about 65 to 70 custom homes since they began working together—about six to 10 per year. “Some we build, some we just do the design,” O’Malia says. Felicia Oliver, a writer who covers home building, is based in Chicago. Comments on: "Back Story: Actively Passive"